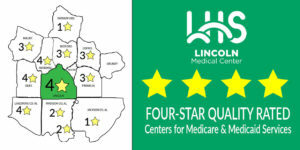 Lincoln Medical Center is proud to announce it has received a 4-star quality rating from the Centers for Medicare & Medicaid Services (CMS) in the most recent review. The ratings range from 1- 5 stars and 63% of hospitals received 3-stars or lower placing LMC in the top 37% of hospitals nationwide ranked in the survey. Ratings are based on quality measures reported on Hospital Compare from 7 categories: mortality, the safety of care, readmission, patient experience, the effectiveness of care, timeliness of care, and efficient use of medical imaging. The overall hospital rating shows how well each hospital performed compared to other hospitals in the U.S. The star-ratings set by CMS is designed to assist patients in making educated decisions on where to choose for health care. The ratings are updated twice a year and are available at www.medicare.gov/hospitalcompare.